This is the long version of our report back on the Walk the Talk action in Albany, and the #FirePruitt actions in DC – if you prefer shorter versions of these reports and updates, subscribe to our email list on the home page. We start in Albany, so click here if you want to skip ahead to the Pruitt news, click here. And to cut to the chase – we’re looking to raise another $500-$1,000 to cover the costs of this. The funds will be used to support travel and logistics and legal support for more than 55 people (all of whom need to return to Albany next week for a court date. Click here to chip in if you can. The week got off to an AMAZING start on Sunday with the Cuomo Walk The Talk Action Camp. about 100 of us gathered in Athens, a few miles south of Albany, for an all day planning meeting, art build and action walk through. It was an intersectional crowd with first time action takers in their late teens and twenties, and experienced grandparents who’d planned or participated in hundreds of direct actions before. Our friend Eric took amazing photos so you can see how it looked. With our plans made, our art painted I shot everyone a quick email asking for donations and cued it to send the next day while I was at the action. It’s a good thing I did because Monday was BUSY! We were just one of more than 100 organizations that endorsed the Cuomo Walk the Talk action, and every group brought something to the action. One of the biggest was busses: more than 1500 people came on 19 buses from Buffalo, Syracuse, Utica, Rochester, Elmira, Caroline, Brooklyn, Manhattan, Long Island, Oneonta, Binghamton, Westchester, the Hudson Valley, and Ithaca. Together we formed a massive crowd, too big for the sidewalks we were permitted to hold and pressed in close to hear Karenna Gore, Tim DeChristopher (Fresh from their necessity defense win in Massachusetts last month) speak alongside frontline community leaders from Sheridan Hollow. Sheridan Hollow is a frontline EJ community in Albany that is home to a power plant that used to burn trash. Now, Cuomo wants to convert it to a fracked gas powerplant, deepening the city and the region’s reliance on fossil fuels. From the opening rally, we marched just under a mile to the Statehouse lead by beautiful art, two brass bands, and a whole lot of energy for our 3 demands — ending all fracking infrastructure, moving to 100% renewable energy, and making polluters pay, where we heard some more from young leaders like Lee of Sane Energy and Patrick of New York Communities for change. They fired up the crowd (tired from walking the last few blocks up a steep hill) and then lead people inside to rally in the only public space big enough to hold our crowd. More great photos from Eric here. But it was at that moment that our “red team” split off from the main rally. Instead of going to the staircase, we headed directly for the Governor’s office. In the “war room”, decorated with murals of New York’s conquests in war, we sang and unfurled a giant sun-shaped banner that exactly covered the state seal on the floor. Then we marched for the Governor’s office, but the State police literally shut the door in our faces: locking the glass door from the main stairwell to the “hall of Governors” that leads to Cuomo’s ceremonial action. The message from Cuomo was clear: when it comes to demands that he Walk the Talk on climate, he doesn’t want to hear it. But we weren’t taking no-answer for an answer. So 55 people including friends from BXE, Sane Energy, NYCC, and Food and Water Watch, sat down and refused to leave until Cuomo met our demands: ending all fracking infrastructure, moving to 100% renewable energy, and making polluters pay. I was especially moved by the action that Kim and the team from Sane Energy had devised: Each of the 55 arrestees sat down on the floor, and one by one read a short statement on why they were there, which they’d also written on piece of red ribbon. Many people talked about the need to protect their children and grandchildren; some young people talked about the uncertain future their generation faces; and more than one person paid homage to David Buckel, a civil rights lawyer and environmentalist who set himself on fire to protest fossil fuel use, after leaving a suicide note nearby. After each person read their statement, they tied themselves to their neighbor with the ribbon – so that they were literally bound together by their stories. And here’s the Livesteam of the whole 3 hour long action. The next day, I jumped in a car with a few of the BXE folks who’d been arrested and drove back to the DC-Baltimore area. But all 55 of the arrestees have to return to Albany next week for a court date. We’re raising money to send to Sane Energy, who coordinated the action and is making sure that everyone gets to their court date and stays free. If you can, please chip in to support this action and the ongoing support costs. We were back in DC because Scott Pruitt was scheduled to testify before a congressional subcommittee. 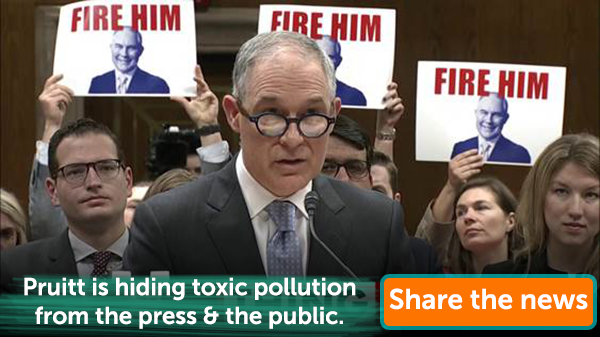 More than 225,000 Americans have signed on to demand Pruitt be fired after a wave of scandals – including many 198 methods members – and we wanted to make sure he felt the heat. With leadership from Friends of the Earth, we created a carnival atmosphere outside the Rayburn congressional office building. FOE passed out fliers at every entrance, so there was no chance that any member of Congress or their staff could ignore our message that it’s time to #FirePruitt. And a team from several organizations waved signs, danced in a giant Pruitt head and generally had a good time making Scott Pruitt look ridiculous. Pruitt however, did not look amused as he jogged past our protest. So it was a good thing Lukas from FOE recognized him and shouted a question about his corrupt, climate denying tenure as Trump’s EPA administrator. The reception inside was not much better: as members of Congress sharply questioned Pruitt on how he broke the law to spend more than $43,000 on a soundproof phone booth for his office, more than $143,000 on first class flights (often back to his home state of Oklahoma), more than $3 million on a massive security detail he didn’t need and gave more than $100,000 in raises to his friends, in direct defiance of White House guidance. As Pruitt tried to explain away his sweetheart deal to rent a fossil fuel lobbyists’ condo for $50 a night I was part of a team of activists who raised signs that read “Mr. 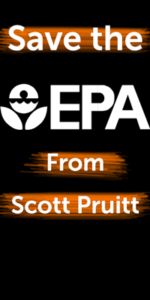 Corruption.” For a moment, you couldn’t even hear Pruitt’s answer over the sound of the press corps’ shutters furiously clicking away. 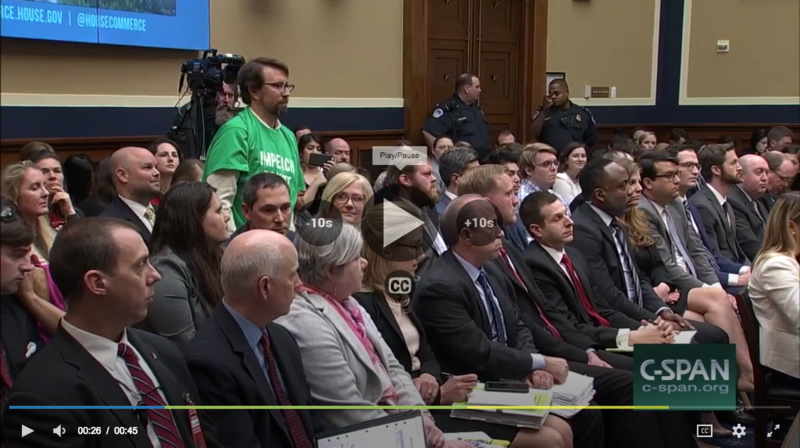 I was I was lucky to get a seat right behind Pruitt, so my sign was clearly visible on the Cspan live stream carried live on several networks. 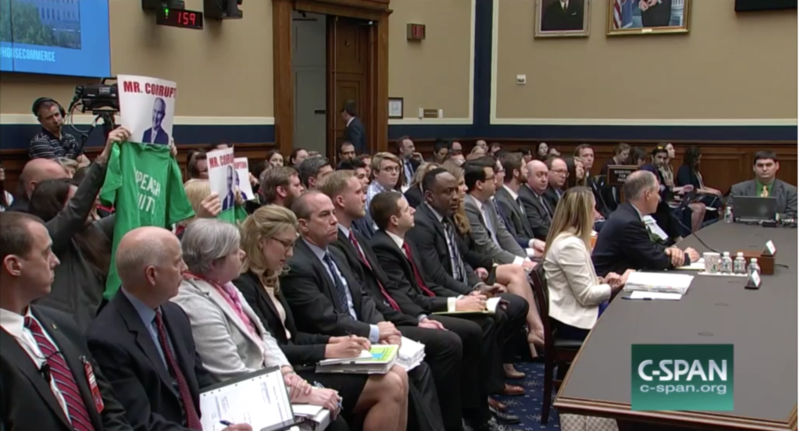 Pruitt stammered on for a moment, until Chairman of the committee told everyone that if they held up signs or displayed any t-shirts with writing on them, they would be arrested. I didn’t want to get arrested, but a minute later another Republican was praising Pruitt for rolling back clean car standards and inspections on refineries, and I couldn’t take it. I put on my oversized “Impeach Pruitt” shirt over my suit, stood, and slowly shuffled out of the hearing. Lucky for me, the Capitol police decided not to press the issue further – and while they banned me from the rest of the hearing, I was not arrested. 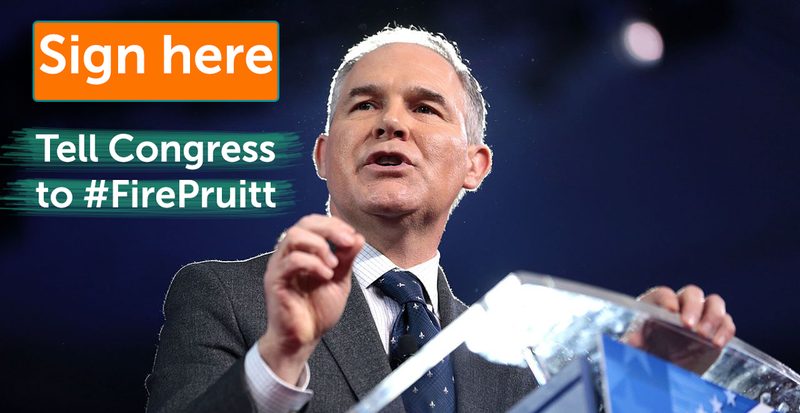 Although i was thrown out, Pruitt stayed on Capitol Hill for a second hearing, where he continued twisting the truth and defending the Trump Administration’s racist, climate denying policies. While I stood outside in the hallway with Erich Picah and staff from Friends of the Earth, several staffers for Democratic members of Congress thanked us for speaking out – and today, the papers are full of pictures from our action inside and outside the hearing room. But it’s also become clear from Republicans’ weak questions and the tone of coverage on Fox News that Pruitt isn’t going to resign and Trump is less likely to fire him today than before the hearing. That doesn’t mean we’re giving up – it means it’s up to Congress to fire him, just as our petition asks. 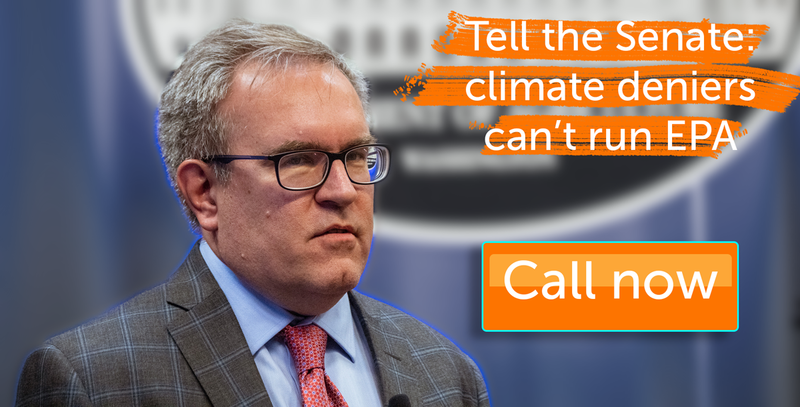 Both actions this week had a similar theme: Confronted with a Trump administration that denies climate science and does the bidding of the Fossil Fuel industry, we need local leaders and Congressional Climate Hawks to take bold action on climate change. But too often we get climate peacocks like Cuomo: politicians who talk a good game about how they care about climate change and support renewable energy, but also “frack us in the back” to quote Lee Z from Sane Energy at the Albany action. 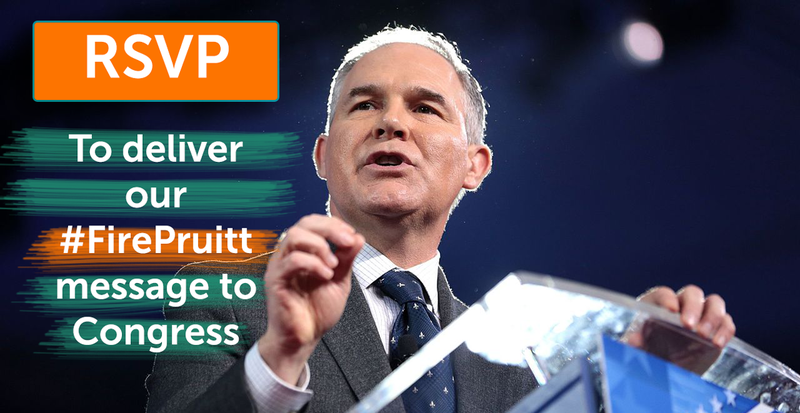 It’s the same story in Congress, where more than 140 lawmakers from BOTH parties have called on Pruitt to resign, but not one of them, yet, has introduced binding legislation to remove him or called for his impeachment. That’s why we use digital tools to support direct action campaigns. By raising the stakes – with a sit in outside Cuomo’s office and standing up in an impeachment t-shirt at Pruitt’s hearing – we demand more than talk from our leaders, and we show that we’re not going to be placated with happy talk about solar power or “believing in climate change.” And by broadcasting these actions online, and providing ways for you to sign on in support with internet petitions, call in actions, and more – we expand the reach of those actions and share the stories that inspire us with a much larger audience. Just like at the Albany action, where activists were literally and figuratively tied together by their stories, 198 methods uses digital tools to tie our direct actions for the climate together with a bigger, more powerful community. If you value that connection, or want Drew to keep traveling to more actions (maybe in your town next time!) 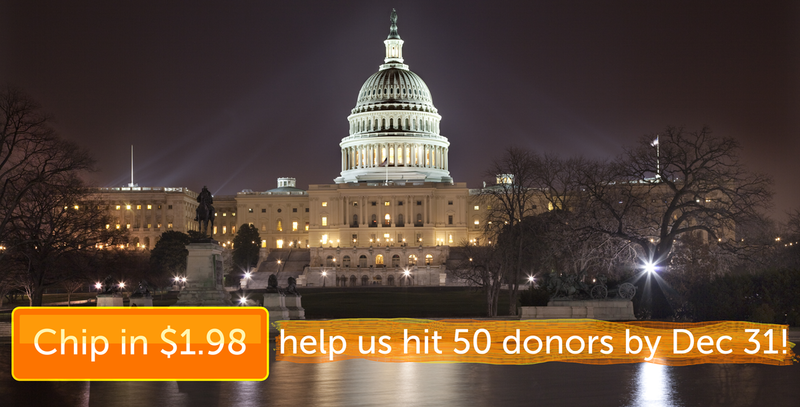 to deliver support, risk what others cannot, and bring you back recordings, live streams and online actions you can take in solidarity – please chip in to support our work.